Why is there an epidemic of chronic illnesses that plagues 54% of our children today? Why do so many of our children suffer from ADHD, anaphylaxis from severe allergies, asthma, autoimmune diseases and epilepsy, in addition to other chronic illnesses and neurodevelopmental disorders? These questions remain largely unanswered and mostly ignored by the medical establishment as the numbers of children suffering from these conditions continues to rise. The most obvious question to ask is: what could cause these conditions to arise in our children at such alarming rates? We live in a world where pharma-backed, government sanctioned, medical mandates in the form of liability-free vaccines with known serious potential adverse effects are forced repeatedly in greater numbers (70 doses of 16 vaccines by age 18) onto our most vulnerable and voiceless populations—with a disastrous outcome of life-altering iatrogenic illnesses, artificially induced in our children and youth. The main vaccine producing companies, the “BIG 4”, Merck, GSK, Pfizer, Sanofi, who make all our children’s vaccines, list the very illnesses now seen in epidemic numbers in our children, in their own vaccine inserts, as potential adverse effects. In 1986, Congress passed the National Childhood Vaccine Injury Act (NCVIA), which gave liability protection to vaccine producers who were getting sued and losing in court for injuries caused by their vaccines. In effect, by reducing product liability, Congress, through NCVIA, gave license to vaccine makers to produce substandard products by taking away the ability of the consumer to sue the vaccine manufacturers directly for injuries. Following the passage of NCVIA, the number of vaccines on the childhood schedule mushroomed, creating a gold rush for vaccine makers: the vaccine industry went from a $1 billion industry to a $50 billion industry. But this expansion in the vaccine industry, in fact, is relatively small in comparison to the even greater gold rush for the BIG 4 companies. The drug “treatment” side of the equation, which is substantially more lucrative than the “gateway” vaccine side the BIG 4 already monopolized, now also increased substantially. The vaccine manufacturers began to capitalize on the known adverse effects of their vaccines, and have since created drugs for the “treatment” side of the equation as well. The lack of incentive to make safe products, which created the bloated vaccine schedule, became the gateway to the lucrative drug treatment side for these companies. Today, the BIG 4 monopolize vaccines as well as the drug “treatments” for chronic illnesses known to be induced by vaccines. First, vaccines push kids off the cliff, and then vaccine makers profit from “rescuing” those they don’t kill. The lack of incentive to make safe products, which created the bloated vaccine schedule, became the gateway to the lucrative drug treatment side for these companies. The outcome of strategic, toxic, early interventions in producing lifelong “sick customers” is not an accident— just follow the money. It is NOT A COINCIDENCE that the same BIG 4 companies, GSK, Merck, Sanofi and Pfizer, the largest manufacturers of vaccines in the U.S., happen to also produce the top grossing drugs that treat the most common side effects from their own vaccines: Autoimmunity, asthma, anaphylaxis, allergies, ADHD, rheumatoid arthritis, epilepsy, etc. 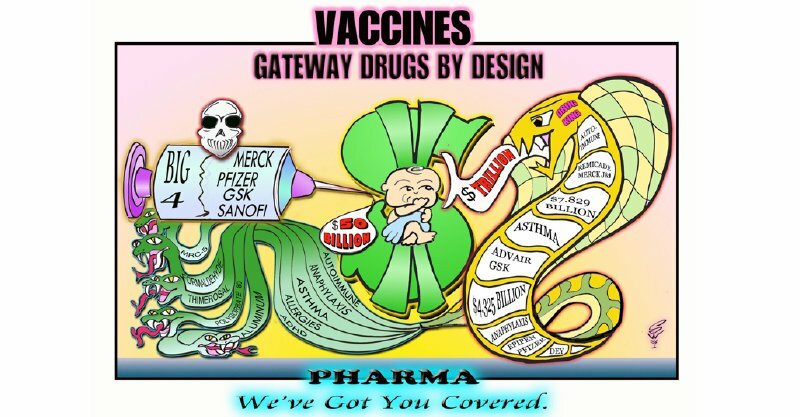 Vaccines have become, from the industry BIG 4 perspective, seeds that grow their massive drug market, in the form of millions of lifelong sick customers in need of the treatment drugs these very same companies supply. Vaccines, in fact, make up the foundation of the BIG 4 trillion-dollar drug skyscrapers built on treating the chronic illnesses they KNOWINGLY create with their vaccines (again, the adverse effects are written in their vaccine inserts). Profits and profitability are the driving forces for all for-profit businesses. From an economic point of view, vaccine makers no longer simply design vaccines for their purported purpose of conferring immunity to various infectious diseases. Vaccines, in fact, create a far more profitable, indentured, chronically ill “market” of consumers for their drugs. In other words, our perception of vaccines as immunization agents is limited and myopic, if we do not consider the “business model” they actually feed into. A blockbuster drug generates over $1billion in annual sales. Table 1 is a partial list of the BIG 4 drugs that treat the most common vaccine adverse effects sited in their vaccine inserts. 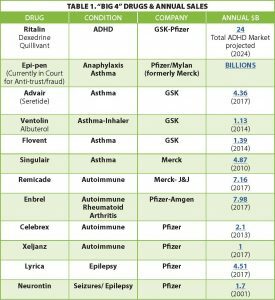 The table shows their “blockbuster” drugs, generating over $1billion in annual sales in treating ADHD, anaphylaxis, asthma, autoimmune conditions, and epilepsy. Among these blockbuster drugs, Advair (GSK) has grossed almost $100 billion in sales, to date, and is the 3rd best-selling drug in history. Remicade (MERCK) and Enbrel (PFIZER) are also in the top 10 of all drugs in history earning $90.3 billion and $81.2 billion respectively. Singulair (MERCK) has generated $47.9 billion and is among the top 20 drugs of all time. ANY SYSTEMATIC INVESTIGATION of the modern relationship of medicine and science to industry must consider what has become the epiphenomenal case of the tobacco industry as it confronted new medical knowledge about the risk of cigarette smoking in the mid-20th century. This, of course, is not to argue that the approach and strategy undertaken by big tobacco are necessarily typical of conventional industry–science relationships. But the steps the industry took as it fashioned a new relationship with the scientific enterprise have become a powerful and influential model for the exertion of commercial interests within science and medicine since that time. The pharmaceutical industry has taken tobacco tactics to a new level of corruption. What if tobacco companies were not only creating addictive, carcinogenic cigarettes, but in another “arm” of the industry, they were simultaneously making billions on cancer drugs, all the while claiming their cigarettes are safe as illustrated through their bogus, purchased “scientific” studies? That is precisely where we are with the vaccine paradigm of “shot and pilled”. It’s not only the hijacking of public policy that’s troubling, but also the many people who are either trusting of the system or unaware of what is really happening—and therefore willing to surrender more rights and power to the behemoth, self-serving industry that will go to any lengths to retain its monopoly on “health” paradigms. The extent of manipulation and downright criminal conduct by Pharma, in collusion with the government and media, is breathtaking. 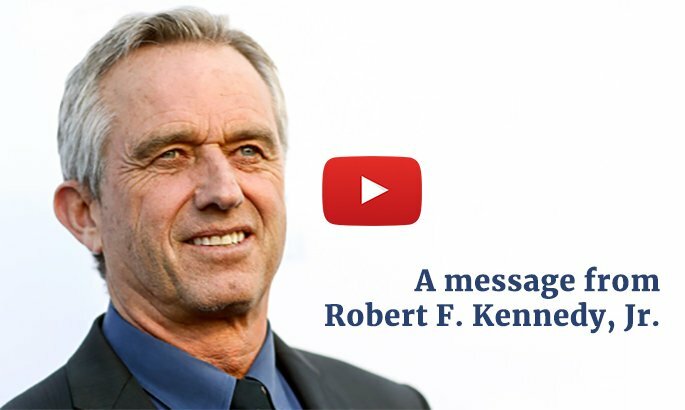 The attempts to coerce legislation to take away vaccine exemptions from families, along with the blatant disregard for the basic human right of informed consent, in addition to the Pharma-backed pressure to censor social media, the last bastion where metaphorical freedom of assembly and free speech were still mostly intact, speaks volumes about the true Pharma agenda, which cannot withstand scrutiny and truth.